I first heard about Friends of Ham when I met owner Claire Kitchen and her husband (and business partner) Anthony for a drink to chat about the new craft beer bar they were opening in Leeds. At that time the bar didn’t even officially have a name, and they just wanted to have a chat with me about the Leeds beer scene and get my thoughts on what they were doing, which from my point of view was great as I got the inside scoop on a new craft beer bar. Well things have moved on a long way now; the bar has a name, face, and most importantly, a home (though I've been sworn to secrecy as the license isn't 100% confirmed yet). You can get an idea of the style of the place from the mockup below, but this is just a concept design at present - it will invariable look slightly different in real life. Still, looks pretty good to me. 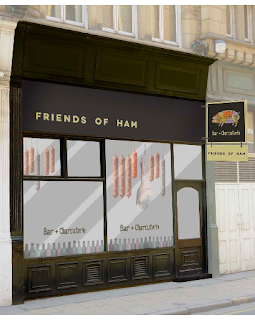 Friends of Ham is something of a novel concept, taking inspiration more from the Soho Deli-Wine Bars than it does from a traditional Yorkshire pub. But unlike the aforementioned wine bars, Friends of Ham makes its focus beer - with quality craft keg, bottled, and cask beer served alongside international and local cured meats, air dried hams, charcuterie and cheese. A range of good wines (but no spirits) will actually be available too I’m told, but the owners are beer lovers who want to share their personal passion with the public – what better reason could you have to open a bar but that? The pairing of beer with food is a big part of the Friends of Ham ethos, and I’m told the deli style menu will give suggestions as to what beer and food matches will work, as well as the staff encouraging and suggesting pairings too. This idea of true tapas style nibbling while you sip is something which is very slowly starting to take hold in the UK drinking scene, with places such as Veritas being the only place in Leeds which currently takes the idea to heart. There really is nothing better than sitting around a table with friends enjoying interesting beers alongside a few small plates of delicious morsels, and Friends of Ham is shaping up to be the perfect place to do that when it opens (fingers crossed) early this summer. When the bar opens I'll most likely be heading down to sample their wares, and I'll post here how it looks and what I think of it. Yep - looking forward to this one. Why? Something ....different. Know what I mean? would be great if its open in time for #ebbc! I CANNOT WAIT for this bar to open. We really need more unique, different stuff in Leeds, so will await the news of this bar opening with interest. Thanks for sharing. Another beer and meat fan looking forward to the opening! Woo! It's definitely something different for Leeds. Should be absolutely awesome. I think they are aiming for a summer launch. Follow em on Twitter or Facebook and ask em! Sounds wonderful - from Jealous of Birmingham!